A powerful-looking upper body starts with a chiseled chest, and there’s no better way to achieve it (yes, for you too, ladies!) than with these must-do chest exercises. Do not fall pray to the trap of neglecting your chest muscles. The muscles in your chest may be smaller and less popular than some of our other, more-preferred muscle groups to work (ahem, glutes, biceps, abs), but they’re absolutely essential if you want a well-balanced physique. 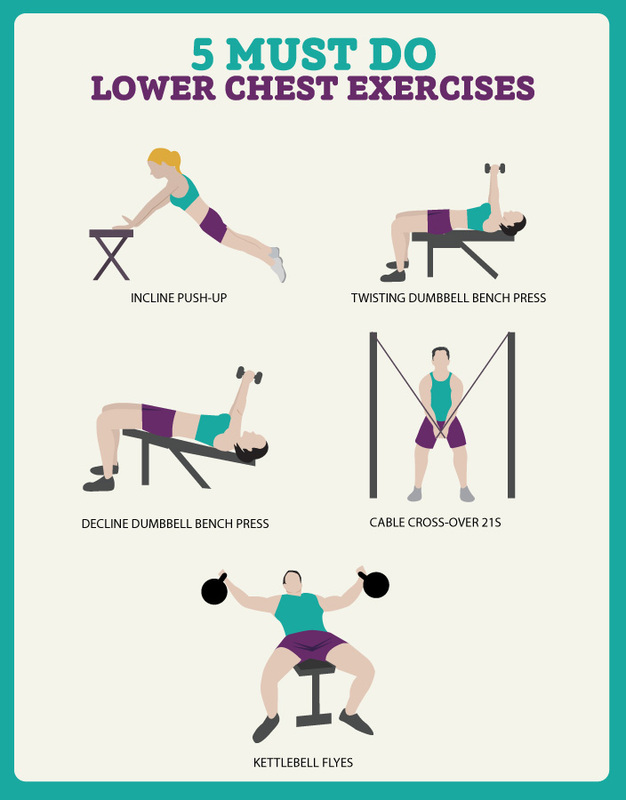 Try incorporating these chest exercises into your routine to strengthen and shape your pecs. Warm up your chest by starting with an incline push-up to engage the muscles. Grab a chair or place your hands on a bench to begin. Now that your lower chest is nice and warm, get ready to strengthen with weights. Grab your dumbbells and head back to the bench for a press — with a twist. That is, twist the weights as you press the dumbbells to the top. After completing the twisting dumbbell press, set the bench to 45 degrees for a decline press. Move onto a decline dumbbell bench press to engage your chest muscles through angle and weight resistance. If you have a cable machine or there’s one at the gym, be sure not to skip cable cross-over 21s. The next exercise of cable cross-overs really helps target the chest by changing up the arm position from low to high with a set for each. Move onto a set of kettlebell flies from the bench for a tougher grip that works your lower chest. Since kettlebells are difficult to balance, your chest has to work that much harder to complete this movement properly — and that means more toning. Finish up the lower chest exercise routine by grabbing a partner for incline dips. Don’t forget to release the tension with a standing wall pec stretch or by pressing your hands out to your sides with your fingers to the sky. Now you can efficiently work out at home and have that perfectly developed chest. All you will need is some space and the dedication. These press-ups are considered the top 9 best chest exercises at home because one does not require any equipment to do the exercise.